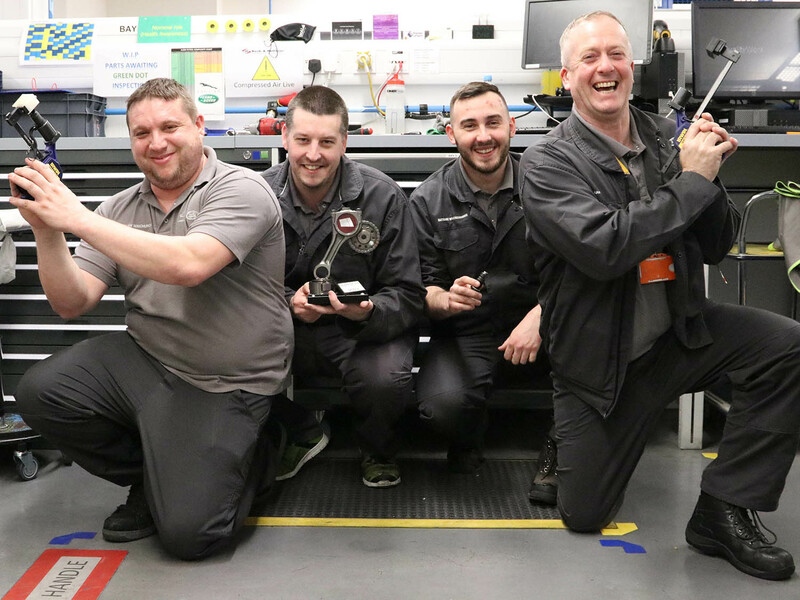 A four-man team from the EMC’s petrol Customer Focus Centre (CFC) are relieving the tension and improving scrap cost, through the creation of a new resetting tool, whilst also winning the facility’s Kaizen of the Month competition. 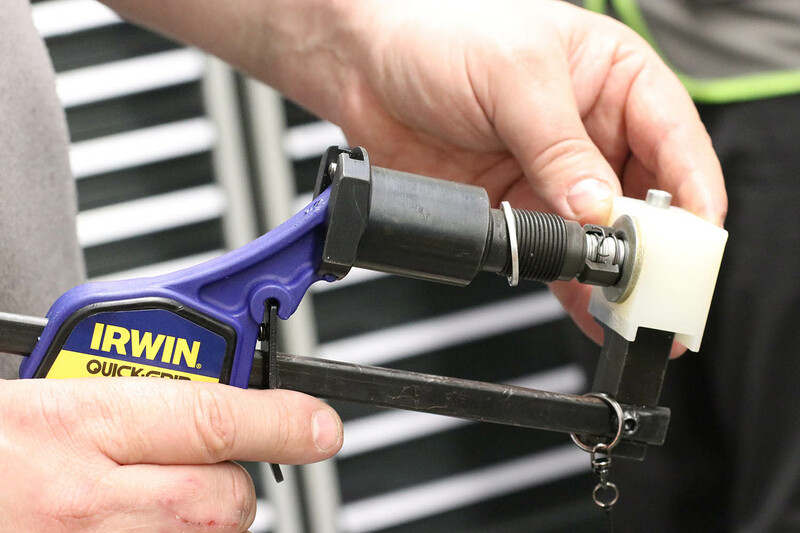 In a first for the facility, the team worked to create a resetting tool which would make the tension bolt fitted in zone 7 in the assembly hall reusable. It was previously being scrapped, despite being a reusable part, as a tool and system did not exist to reset it. The bolt puts tension onto the engine chain, supporting the timing of the engine. It was being removed as part of the CFC’s investigation and tear down process; a daily occurrence. The team were keen to take on the challenge and solve the issue. They were also aware of a stock pile of tensioner bolts that were awaiting reset in the facility’s diesel assembly hall and at £5.95 per bolt, realised that their solution had the potential to save the business thousands. Led by Steve Winchurch and Alan Hoof, the project was a real team effort. Mat Wojciechowski, used his skills as a amateur mechanic to set about working on an initial design for the tool and David Shaw, who previously worked as a tool setter, before joining Jaguar Land Rover, created a prototype tool that would later form the basis of the final tool worked on by the EMC’s Kaizen team. Team leader Alan also made sure it was put forward as a Kaizen, eventually leading to it being picked as the winner in the EMC’s Kaizen of the Month competition. David Shaw said: “We do quite a lot of kaizens in CFC, as we see so much of the engine. We have a much wider knowledge of the entire engine and how it works and can therefore more easily identify potential improvement in processes and tools. “Mat created an initial design, but we didn’t have the correct tools to do the entire project, so we engaged the skills and capabilities of the EMC’s Kaizen team to do the rest. In all it took about a month from the start of the project to getting the tool back. It would have taken less time, but we all work shifts, so we had to fit in seeing the Kaizen team, with when we were working days. The Kaizen made the most of the skills and interests of the entire team. Mat, who spends most of his time working on cars, in the garage, outside of work, has already gained some great expertise whilst in CFC, completing two rework projects in the last couple of years. Steve is referred to by the rest of the team as the main person behind the latest kaizen project. He similarly started working at the facility in petrol assembly, having spent 12 months with logistics supplier syncreon. He’s an avid mechanic and especially loves tinkering around with his motorbike. Alan is a team leader in CFC, he was one of the early members of the EMC team, joining the facility in July 2014, as part of cohort 10. “I started off working in the diesel assembly hall, before we were even producing engines, moving to CFC in August 2015, working on reworks on the skeleton shift. As soon as I walked through the door at the EMC I wanted to progress and become a team leader. We do quite a lot of kaizens in CFC, as we see so much of the engine. We have a much wider knowledge of the entire engine and how it works and can therefore more easily identify potential improvement in processes and tools.